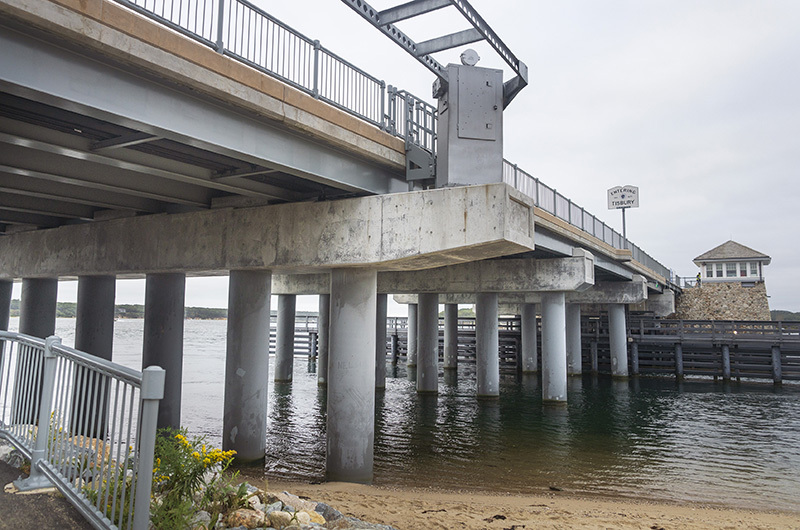 Connected by the Lagoon Pond drawbridge and also many issues, Tisbury and Oak Bluffs are beginning to discuss collaboration across town lines. Funding for regional health and human services programs, the role of the county in distributing the funds and more accountability and transparency for how the money is spent are all active topics for discussion as Tisbury and Oak Bluffs begin to talk across town lines about sharing some services. Selectmen from the two towns began meeting regularly this fall. In the short term, steps are being taken to share a building commissioner. In the longer term, the two towns want to get a better handle on annual spending by towns on an array of regional health and social service programs across the Island. To that end, a joint committee has been formed to examine social service programs and how they are funded by the towns. At a meeting last week, the two-town group agreed to send a joint letter to Martha’s Vineyard Community Services, Vineyard Health Care Access, the Center for Living, the Healthy Aging Task Force, the Dukes County Human Service Department, and the Substance Abuse Prevention Program asking the agencies to look for areas of overlap. According to the letter, Oak Bluffs and Tisbury contribute more than $578,000 to human service programs through both annual town budgets and individual warrant articles. “I think we’re talking about accountability here, and how the towns feel . . . the money they’re sending to the county to get to these services is accounted for, and who is doing the oversight,” said Tisbury selectman Melinda Loberg. “It’s making them get together to see what services they provide to see if they could operate more efficiently,” said Oak Bluffs selectman and board chairman Gail Barmakian. “Really the county at this point is just a pass through,” said Tisbury selectman Tristan Israel, who is also a county commissioner. Meanwhile, the group reviewed a draft agreement for sharing a building commissioner. Under the draft plan, the two towns would share one building commissioner who would oversee building regulations in each town. Each town would also have a full-time local inspector, specialty inspectors and a full-time administrative assistant. One town would employ the building commissioner, and the other town would send quarterly payments for its share of the cost. Selectmen tentatively agreed to adopting the new structure for the next budget cycle beginning July 1, but Mr. Grande noted that current personnel uncertainty in Tisbury’s building department complicated his ability to set a firm date. Mr. Israel said the goal is to be able to commit to the agreement by the next joint meeting, set for late November early December. Leaders from the two towns also discussed shared improvements at Eastville Beach. Both towns are applying for Community Preservation Act funding for beach improvements. Town administrators said their DPW directors would collaborate to come up with a maintenance plan. Mr. Whritenour said one priority is making sure the beach and parking lot are accessible by state and federal standards. Group members lauded their new shared venture. “It should be Tis Bluffs or Oakbury, right?” Mr. Israel joked.